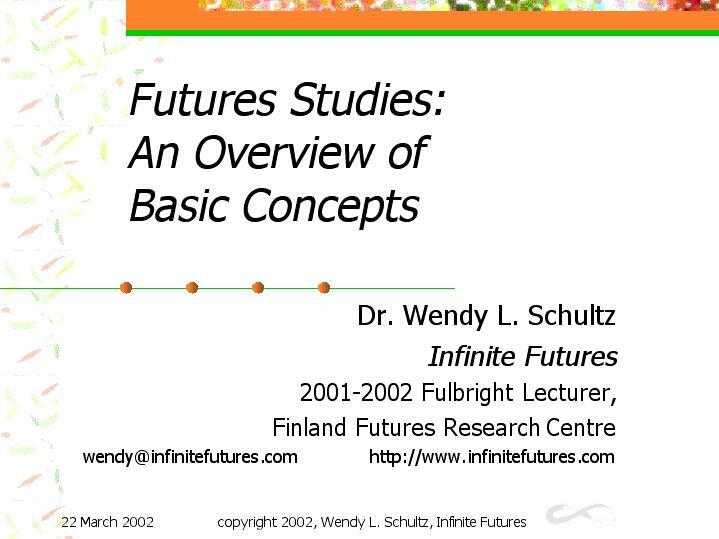 This Powerpoint presentation – both slides and notes – was initially created as an overview to futures research and futures research tools for the TUTU 1 class and the Post-graduate Studies Theme Seminar on that topic at Turun Kauppakorkeakoulu, on 28 February 2002, in Turku, Finland. Over the next two months, in the course of explaining both data-gathering and data-processing (extrapolation, impact assessment, pattern identification, systemic analysis, scenario building, and visioning) within futures studies, the presentation experienced additions, permutations, and transformations. The result is this collection of slides with attendant notes, which I hope offers a useful introductory-level overview to the philosophy, conceptual framework, tools, and weaknesses of what I call – depending on the audience – either applied futures research, or integrated foresight. Please email me your comments, additions, and constructive criticisms.